The theme in Take a World is BEAUTY and what could be more beautiful than the girls painted by William-Adolphe Bouguereau? At some point I thought that these were all the same girl at different moments of her life. Now, it seems that there are two girls maybe sisters... What do you think? I suppose that there are two of them... Definitely beautiful art piece. I think you are probably right. If we look into the paintings, there appear to be only two models. This is a wonderful piece for the beauty theme, Christine. I love Bouguereau's work and what a large collection it is. Aaaaah, Bouguereau... A Master of academic & idealist painting! (There are two different girls I guess). WOW what a lot of young beauties, I love that art work! At first glance I also thought one girl, but looking closer I think there are two. Gorgeous, Christine! 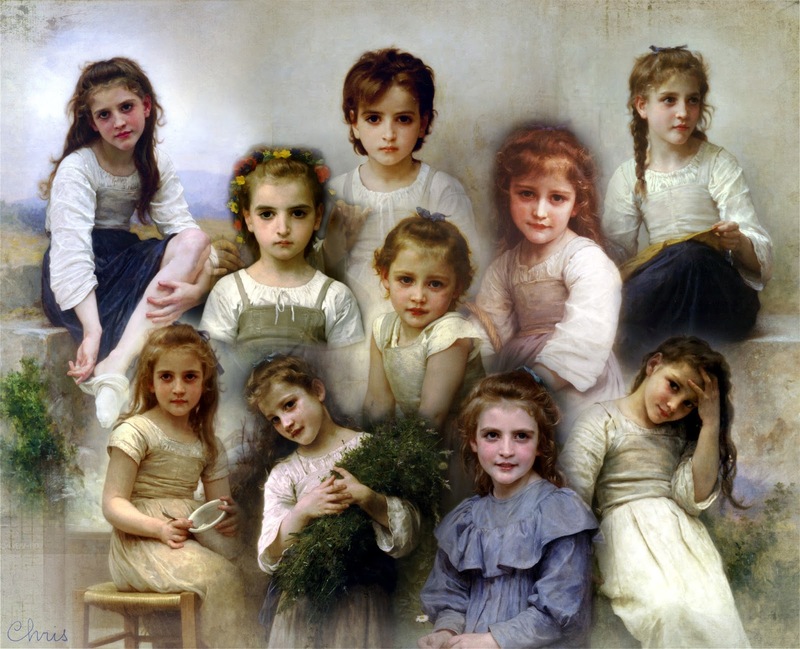 I so agree, Bouguereau created such lovely artwork and I love how you have brought all these beautiful faces together in to one wonderful collage...excellent. I think you're a genius for creating a montage of these beautiful faces! Bouguereau created such beautiful art. I think it appears to be only one girl at different times, as Abby says. You have created the most wondrous montage, Chris, and left me with a conundrum. Is it one or two beautiful girls ..... I just can't decide. Whichever way you deserve a bow from me for such superb work. They do look the same /related- I think it is just his style. At any rate what a gorgeous collage Christine!